Don't come the raw prawn with me, ya flamin' gallah! Neighbours, everybody needs good Neighbours. With a little understanding, you can find the perfect blend. And so on. Back in the late 1980s and early 1990s, everybody watched Neighbours. They might not admit it but, every evening at 5.35pm, after Children's BBC had finished, millions of people tuned their television sets to BBC One to find out what the residents of Ramsey Street had been up to. This was the era of Madge and Harold, Mrs Mangle and Bouncer, Jim, Paul and Lucy Robinson, Helen Daniels, Jane and Mike (played by Guy Pearce) and of course, Scott and Charlene, played by a young Jason Donovan and Kylie Minogue. The show was so popular that in one year the entire cast were invited to star in the Royal Variety Performance, and a range of merchandise was produced to cash in on its success. There were annuals, board games, jigsaws and computer games. 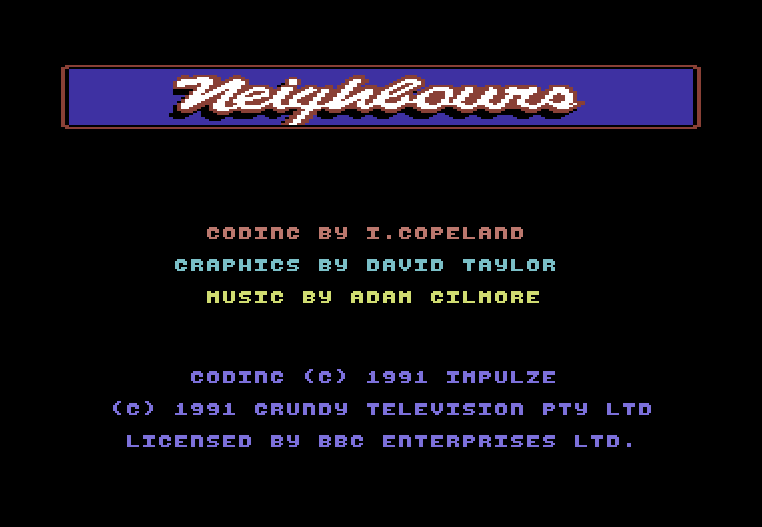 As this website is dedicated to old video games, we'll focus on the computer game version of Neighbours, specifically the Commodore 64 version. Maybe I should start Retro Annuals Power where I could look at old annuals. Before we continue, let's remember the Neighbours theme tune and opening credits. Ah! Memories! So, how do you transfer a soap opera into a computer game? Easy! Turn it into a racing game! And to ensure it accurately reflects the fact that it's based on a soap from the land down under, include kangaroos and emus as some of the obstacles. Strewth, there's no stereotyping in this game! Scott appears to be getting over-friendly with a kangaroo. G'day! Welcome to my garage. The game opens with a SID rendition of the show's theme tune and a rather plain intro screen. I guarantee you that you'll sit and listen to the full theme tune while trying to remember the words to it. Or maybe that's just me. Afterwards, you pay a visit to Scott Robinson's garage. This is where you can pick from up to four other Ramsey Street residents to be your competitors and either a slow, medium or fast skateboard. There is also a small car and a kangaroo on the floor of the garage, partially covered by a sheet. As we know, every Australian keeps a kangaroo in their garage. Usually next to their barbecue, a crate of Fosters, a boomerang, and a hat with corks dangling from it. You can choose to cover the car or kangaroo with the sheet if you wish. Concealing them will prevent them from appearing in the game. The characters you can pick as competitors are Lenny (who? ), Henry, Matt (not sure who he is either) and Mike. Apparently Lenny could be Charlene. I don't ever recall her being called that but according to a Neighbours website, it was her nickname. You learn something new everyday, don't you? As the game was released in 1991, I don't think Mike, Henry, Scott or Charlene were still in the programme then. I even think their pop careers had taken a nose-dive too by then. Rack off you dag. Bouncer appears to be in this screenshot. The filthy mongrel! Scott meets an emu in Ramsey Street. Crikey! After you've chosen your opposition, a skateboard and decided what to do about your kangaroo, it's time to hit the road. It seems that in a long-forgotten episode, the Ramsey Street youngsters have been out and turned said street into a race track. They also appear to have rearranged the street, making it appear more like a maze than the cul-de-sac familiar to viewers of the TV show. 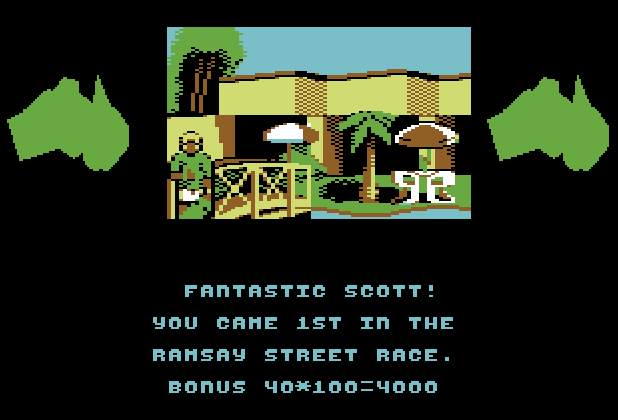 Yourself as Scott Robinson and your competitors line up and begin racing. Rather bizarrely, each competitor has a different mode of transport. You use the skateboard that you picked earlier, and another of the racers also uses a skateboard, but the other competitors use a go-kart, bicycle and what looks like a lawnmower. Not that it really makes any difference to the race itself. Movement around the course is quite fluid although a bit fiddly at first, especially when taking corners. The idea of the game is simply to come first in the race, but making life more difficult are obstacles and the fact that you have to ride through pairs of markers. If you miss the markers, you need to go back on yourself to go through them. Depending on what you did in Scott's garage with your sheet, the obstacles include Mrs Mangle's dog Bouncer, Mrs Mangle herself, open manholes and manhole covers, and kangaroos. Oh yes, not only does every Australian keep a kangaroo in their garage, they also roam suburban streets. Here's a quick fact. In Neighbours, Bouncer, the dog, was paid more than the human actors! He was actually called Bouncer in real life too. That's two things I've learned today. The best way to describe the gameplay is that it's a cross between Micro Machines, Paperboy and Horace Goes Skiing (or any skiing sim for that matter). Colliding too often results in you losing energy, with your energy bar represented by the Neighbours logo which loses colour as it depletes. If you win the race, you go onto another race where you face more obstacles and hazards, a redesigned street, and pairs of markers that are harder to get through. I believe this was Lassiter's and Daphne's coffee shop. And that's Australia either side of it in case you need reminding where Neighbours was set. The race itself is quite fun, but also frustrating. Collisions happen regularly, forcing you back a bit, and break up the flow of the game. If I was any good at the game, this probably wouldn't be a problem. The main problem though is that the street race feels more like a mini game than a full game. 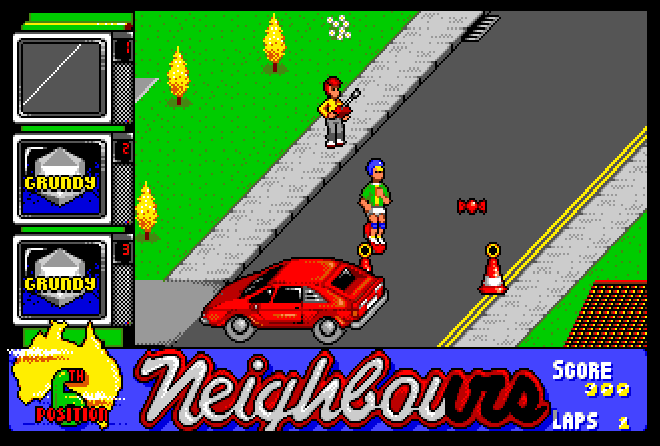 Although the game uses Ramsey Street as its setting, and includes the soap's characters, it feels that the game's link to Neighbours is tenuous to the extreme. Translating a soap opera to a computer game is never going to be easy, which is why there are very few other (if any) soap tie-ins, but more could have been made of the licence than just making a racing game with it. I'm not sure how, but a series of mini-games may have worked better. Maybe some sort of pool game in Madge's swimming pool, or trying to smash the windows of the houses by playing cricket in the street as featured in the opening titles (should I really admit that I remember that part from the show's opening?). Or trying to find out how many times you can play truant from Erinsborough High before Fisher expels you? Mr Fisher was Home & Away, wasn't he? Oh well. Anyway, yes, the game just feels like it's missing something and doesn't really capture the feel of the TV show that well. No matter how many kangaroos they insert into it. 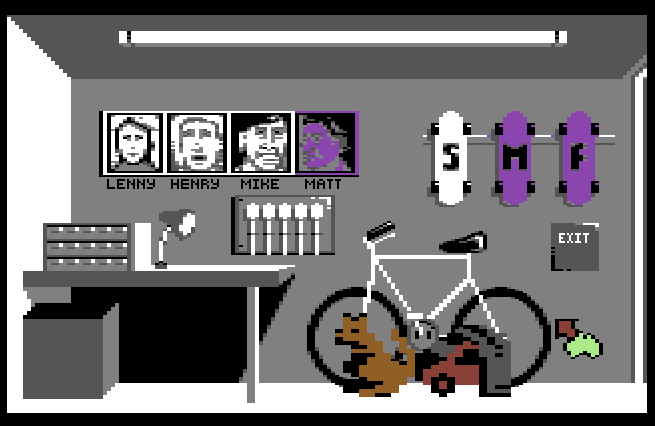 The graphics do their job but aren't really that attractive and appear quite blocky even for a Commodore 64 game. Apart from a rendition of the theme tune, there's no other sound to speak of. Maybe the SID chip was exhausted after producing such a musical masterpiece. 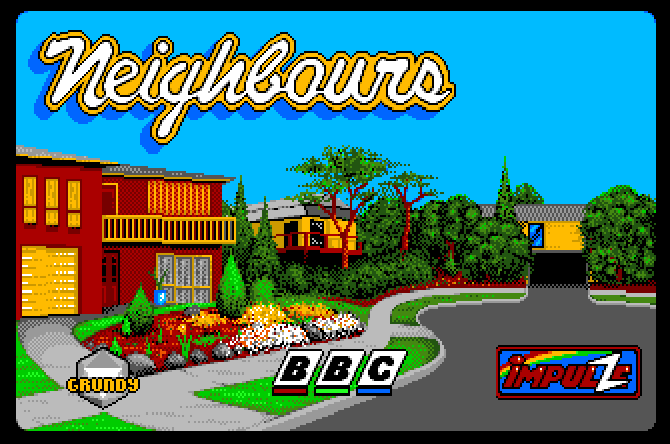 All in all, Neighbours isn't a terrible game but it's by no means a great game. It plays alright for a short period of time, but doesn't really maintain your interest and can feel a bit of a chore to play. It's quite simply a lazy tie-in, which doesn't represent the show it's based on at all well. Aussies on the Speccy! Strewth! 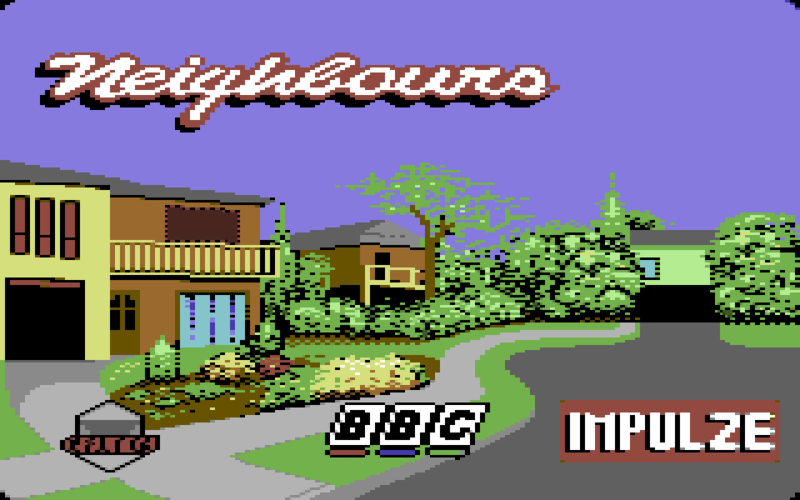 As you'd expect, Neighbours wasn't a Commodore 64 exclusive. Instead, the residents of Ramsey Street found their way onto other computers too. Namely, the ZX Spectrum, Commodore Amiga and Atari ST. The Spectrum version was absolutely awful. With even more fiddly controls than the Commodore 64 version, a horrible version of the theme tune and barely recognisable sprites, you'd be throwing the overpriced cassette onto the barbie within minutes. On the Atari ST and Commodore Amiga, things were a little better. The graphics are much improved, which probably goes without saying due to them being on technically superior machines, and there is a greater variety of enemies and obstacles which make better use of their source material, but the controls are still too fiddly and it just isn't easy, or that fun, to play at all. The opening screen on the Amiga version. Looks just like the TV show. Traffic cones, cars in the middle of the road, some kid playing with his remote control car. Give me Summer Bay any day. A rather plain title screen, and not really anything going on in between action. Dull and blocky and don't really represent Ramsey Street that well. The rendition of the Neighbours theme tune isn't too bad, but there isn't any other sound to speak of. Quite fun at first and gets a bit better when you've got used to the controls, but it doesn't maintain your interest and doesn't draw you in for repeat plays. A lazy attempt to cash in on the popularity of the television show.